A veteran Christian activist and international blogger who faced persecution in Brazil over his support for biblical marriage and condemnation of homosexuality as sin says there’s a specific afterlife that can accommodate the pro-LGBT beliefs of former Anglican Archbishop Desmond Tutu. Tutu is the social-rights activist in South Africa who reached stardom in the 1980s battle over apartheid. He received the 1984 Nobel Peace Prize, the 1986 Albert Schweitzer Price for Humanitarianism and in 1999 for the Sydney Peace Prize, among others. His statements, documented by the BBC, continued. “No, I would say sorry, I mean I would much rather go to the other place,” he said. Tutu was in Cape Town, South Africa, speaking at the launch of the “Free and Equal” campaign. He compared rights for homosexuals to choose their lifestyle to racism in South Africa. No problem, pointed out Julio Severo, who blogs under the name Last Days Watchman. As a result of his work, he was hounded into hiding and then out of Brazil entirely. He continues his work, but from an unidentified location. On a popular forum dealing with a number of biblical issues, Severo tells of blogging about a nation diving into homosexuality and the results. After his blog was launched in 2005, he raised awareness of the proposed law called PLC 122, an “anti-homophobia” plan. “The bill sought to give government the power to exercise out and out thought control and would have criminalized any speech construed as ‘antigay.’ It amounted to nothing less than a direct ban on biblical Christianity,” he said. In response to his activism, PayPal, through which he had been processing donations, refused to do further business with him. 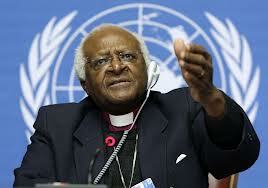 “Tutu would not need to fight ‘homophobia’ in heaven. In fact, he would see no ‘homophobia’ in heaven, because there is no homosexuality there. In the presence of God there are only people delivered from a past life of sins, including homosexuality,” Severo wrote. “Of course, if, as gay supremacists preach, ‘homophobia’ is criticism of homosexuality, then Tutu will not want to go to heaven, which is under the rule of the One who is the author of all condemnation of homosexuality in the Bible,” he continued. Tutu also served, along with Jimmy Carter, on The Elders, a group of world leaders who address issues such as sustainable development, equality for women and the conflict between Israel and the Palestinians.